In this review, we’re going to take a look at the most recently released primary installment of the world’s most popular RPG series, Final Fantasy XII for the Sony Playstation 2. 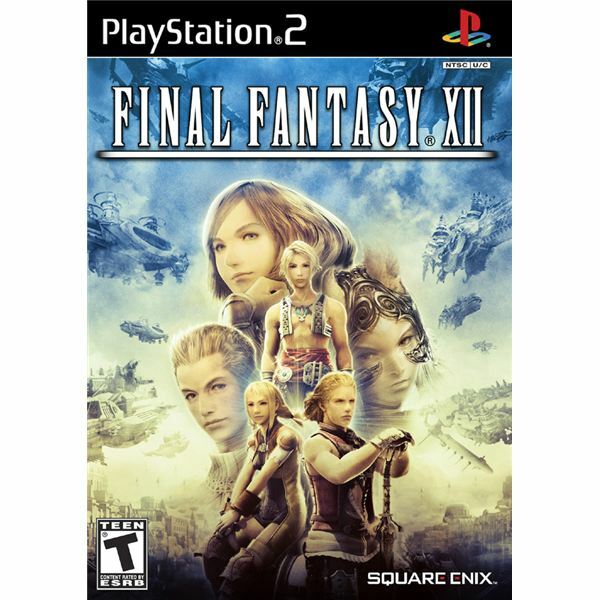 Released in 2006 and published as always by Square Enix, Final Fantasy XII continued the series’ longstanding tradition of excellent sales and tremendous critical acclaim, garnering not only exceptionally high reviews from most members of the gaming media as well as "Best Of" awards from numerous publications. Odds are, most roleplaying fans have already picked up and played through this remarkable title, but in case you haven’t, here’s why you should. As with many Final Fantasy titles of the past, from the very first moment that you boot up the disc, you’ll be overwhelmed with the opening cinema’s "wow" factor. Not only was I blown away that CG this good was possible on the PS2, but I couldn’t get over how close in quality it seemed to the Lord of the Rings movies. The in-game graphics are quite nice as well. The game features large, well formulated character models, creative monster design and a wide array of varied environments to explore. It’s the best looking Final Fantasy released to date (though certain to be outdone by the upcoming Final Fantasy XIII) as well as one of the most visually attractive Playstation 2 titles of all time. Then again, we’ve come to expect such excellence from Square Enix. We’ve also come to expect high quality sound work, and in some ways, FF XII fails to live up to the developer’s past work. On the one hand, the voice acting here is fantastic — far better than in Final Fantasy X. All of the voice actors do an excellent job, and the British accents are quite pleasing to the ear. Music wise, however, the work pails in comparison to other games in the series. Longtime series composer Nobuo Uematsu did only limited work on the score, and unfortunately his absence shows. That’s not to say the music is terrible or anything, but it is a tad bit of a disappointment, if only because of the game’s tremendous lineage. I’m going to award this category a solid four stars, which seem a little unfair given the quality vocal work, but the fact of the matter is that Final Fantasy XII winds up being a victim of its own expectations in the sound department. The tone of Final Fantasy XII is closer in line to the original Final Fantasy Tactics than other games in the series, which means it is less straightforward and heavier on the political intrigue. Personally, I like the more complex plot featured in this game. As it opens, players witness the wedding of Princess Ashe of Dalmasca and Prince Rasler of Nabradia, a marriage meant to unify the two kingdoms. Unfortunately, their bliss is interrupted by an invasion from the Archadian Empire. Ashe’s husband is killed, her father kidnapped and later murdered, and a famed Dalmascan knight named Basch is apparently responsible for his death. Ashe and Basch are two of the characters who figure prominently in the game, and several other members of the cast, including protagonist Vaan, his lady friend Penelo, and sky pirates Balthier and Fran also get caught up in the conflict. Each member of the cast has his or her own story, as well as his or her own secrets. Things are too complicated to describe in great detail here, but rest assured, the story is suitably epic. In fact, it’s one of my favorite Final Fantasy tales to date. A more politically-driven plot line isn’t the only change that Square Enix experimented with in Final Fantasy XII. Gone are random encounters and the turn-based and active-time battles that every other single-player main entry in the series have utilized. Instead, all battles take place on the world map, using something known as the Active Dimension Battle or ADB system. It’s hard to explain, but essentially how it works is that each character has a series of commands called "gambits" which are used to program how they behave in battle. It is rather detailed, and over time, you will be able to instruct a character to, for example, attack unless a party member takes a certain amount of damage, and then they will automatically switch their focus to healing. It is a radical departure for the series, but it works quite well — just be careful out on the field, because in most locations, there are immensely powerful creatures you will most likely need to avoid or free from until much later in the game. Other changes Final Fantasy veterans should be aware of include the fact that enemies now drop loot instead of gil (the game’s currency) and the fact that new skills and other various enhancements need to be purchased via the license board. Even if you think you prefer the old-school style Final Fantasy gameplay, don’t be scared off, because FF XII controls excellently and is a ton of fun to play. Change can be good, and Final Fantasy XII proves it. While it does have many of the series trademark elements, such as the ability to level up, summon Espers, explore vast environments and multi-floored dungeons, and battle impressive looking boss creatures, the fact is that it doesn’t exactly look or feel like any other Final Fantasy title you’ve ever played. The unique story and the tweaks to the battle system made this feel exceptionally fresh and new, but make no mistake. This is a Final Fantasy title in every way. With exceptional production values, fantastic writing, fun combat and incredibly deep gameplay, this is one of Square Enix’s finest console efforts in years. If you don’t already own a copy, this is absolutely a must-buy, especially now that the price has dipped below the $20 mark at most electronics stores and video game retailers.